In the international bestseller "dare to fail" author (billi lim) defines success as a day today progressive journey towards a predetermined worthwhile goal. We need both success & failure to find our rainbow. the ability to grasp this rainbow during the journey is true success. Failure often talks in a dump language, people can't understand it easily other wise the same mistakes can't be repeated. The calm which puts us to sleep, is more fatal than the storm which keeps us awake. Nothing worthwhile is achieved without a struggle, other wise every body will achieve it, if it is so easy. What we are today at this time keeps changing every minute, every second. Past failures should be the guidelines for future success. Until you try, you don't know what you can't do. Education - the aim of education must be to teach a person how to bring out the best in him and to develop himself to his greatest potential. But the end now - a - days seems to be only for the sake of getting a job. We sow our character and we reap our destiny (expansion of we reap what we sow). There is no right way to do a wrong thing. If one continue to do what he is doing, he will always get what he already got. Successful people may fail but the important thing is that they never give up. It is the ability to climb up again after the fall that matters. Nothing in the world can take its place, talent will not, genius will not, education will not, persistence and determination alone are omnipotent. People don't fail but they quit in the middle. Without deviation, progress is not possible. For every problem under the sun, there is a remedy or there is none. If there is a remedy, try it otherwise why worry about it! the sweet smell of success has little meaning without failure. He who is a bankrupt is not the one who doesn't have a cent in his pocket, but the person who doesn't have a dream. Failure doesn't god has abandoned you. It means god has batter idea. Failure is never final. It is impossible to live with a person who has not tasted failure. Nobody learns from success, but learns from failures and mistakes. The author is from a very poor family consisting of 14 children. He has also mentioned his personal problems and how he over come it. 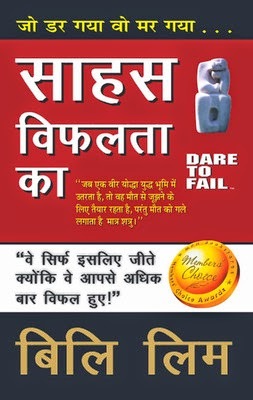 On the whole - this is the book for those who hate to fail! Malaysia's Billi Lim (known as worlds 1st failure Guru) willingly admits that he was born into the lower ranks of society, among people who spoke rudely where "bad" and "dirty" words were the order of the day. He was born on 29th. November 1950 into a family of 14 children. His father was a butcher and his mother an ordinary housewife. His childhood was tough and there wasn't a day that went by without one of his brothers, sisters or even his mother being scolded or beaten up by his father. May be it was that tough upbringing that taught him to take the knocks and survive. Billi, currently Asia's top speaker, is a highly sought after motivational & inspirational speaker whose current speaking circuit covers Malaysia, India, Singapore, Brunei, Indonesia, Thailand, Vietnam, Philippines, Japan, Hong Kong, China, Taiwan, and USA.